Franklin County Visitors Bureau invites the public to explore recreation in Franklin County with the On The Move Rec Guide. The county’ open space lends itself to so many outdoor activities, including hiking, camping, biking, fishing, kayaking, and birding. Franklin County Visitors Bureau highlights Franklin County as a year-round recreation destination with hiking, biking, skiing, birding, skydiving, golfing, fishing, hunting, tubing, and biking in the "2018-2019 On The Move Rec Guide." Franklin County is a good outdoor destination within an easy drive of Washington DC, Baltimore, Philadelphia, and Pittsburgh, offering four seasons of outdoor fun and recreation for all ages and levels of activity. Franklin County includes all or part of four PA state parks—Buchanan’s Birthplace, Caledonia, Cowan’s Gap, and Mont Alto State Parks. Along with the state parks, Franklin County includes Michaux, Buchanan, and Tuscarora State Forests. Complementing these thousands of acres of state forests and state parks are 36 municipal parks throughout the county. The county’ open space lends itself to so many outdoor activities, including hiking, camping, biking, fishing, kayaking, and birding. In addition to the state lands, Franklin County has eight golf courses, a ski resort, and a skydiving center. Franklin County supports an array of recreation on land, water, and air. As well, the county’s recreation activities pair well with the diverse history of the Franklin County plus performing and visual arts and fresh foods, wineries, and breweries. On the Move Rec Guide is one of seven yearly specialty publications that the Franklin County Visitors Bureau produces in its mission to promote the county, including the Franklin County Visitors Guide, Military Trail of History Guide, Fresh Food & Dining Guide, Franklin County Wedding & Event Planner, Spring into History, and 1864 Ransoming, Burning & Rebirth Program. 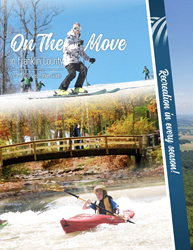 For more on the On The Move Rec Guide and other periodicals, visit http://www.ExploreFranklinCountyPA.com/home/fcvb-publications.